Even though the Boeing 777 makes up a huge part of the Cathay Pacific fleet, my first flight with it happened just recently last June. 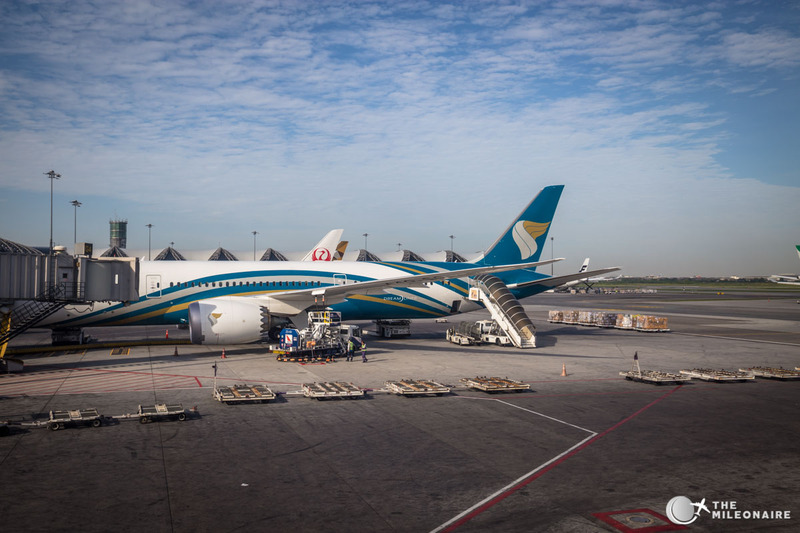 The 777 is Cathay’s backbone for intercontinental routes, but can also be seen on regional routes in Asia. 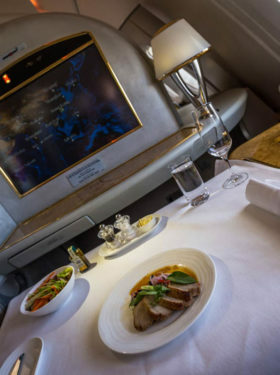 But be careful: the “real” new business class as described in this review is not offered on all flights with the 777 (some of the Cathay 777 still have the old regional 2-2-2 configuration). 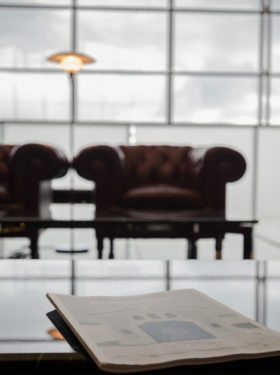 In the following review I’ll keep my focus on the “real” new Cathay Pacific Business Class in the Boeing 777 though! 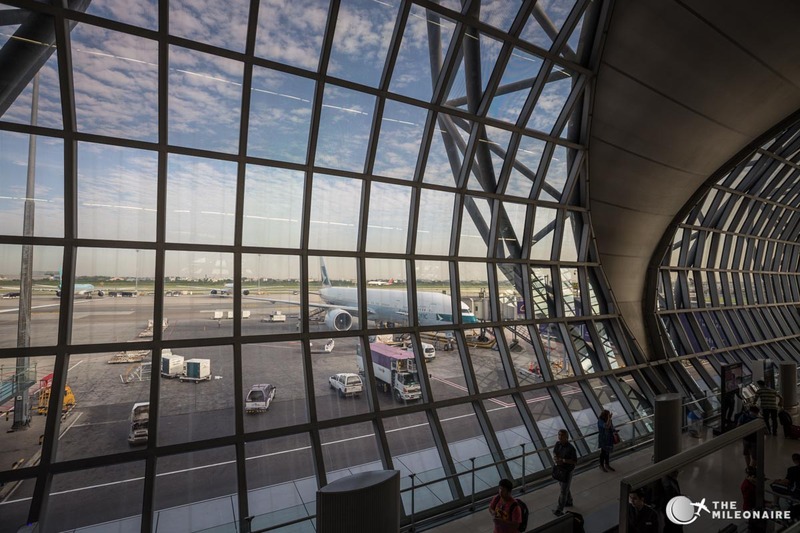 The Terminal in Bangkok’s new Airport, looking at the beautiful Cathay Boeing 777. My plane for today: the B-KQR is a part of Cathay’s fleet since October 2014, mostly flying longer routes. 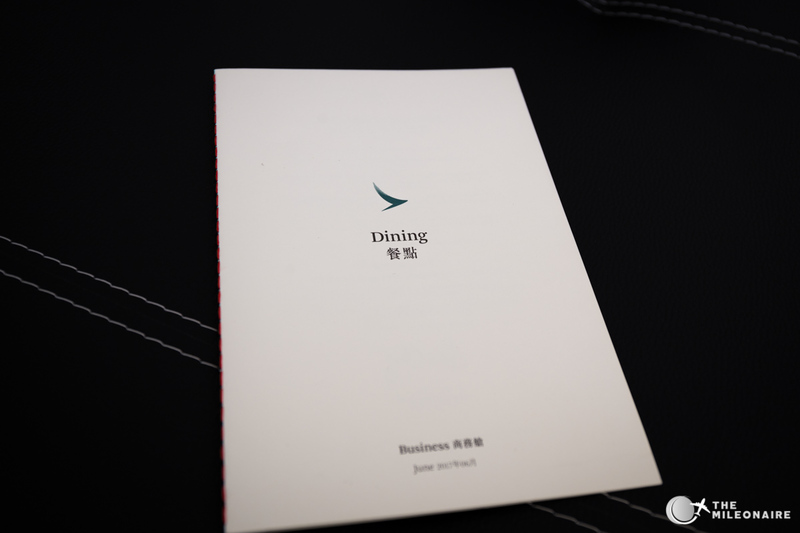 Cathay Pacific has a total of four(!) different Boeing 777 variants flying for them currently, each with a different seat setup for Business Class. The newest configuration has the excellent 1-2-1 configuration, set up in two small business cabins with 2-4 and 7-12 rows each. Especially the smaller cabins in combination with the 1-2-1 configuration create a very intimate setting. 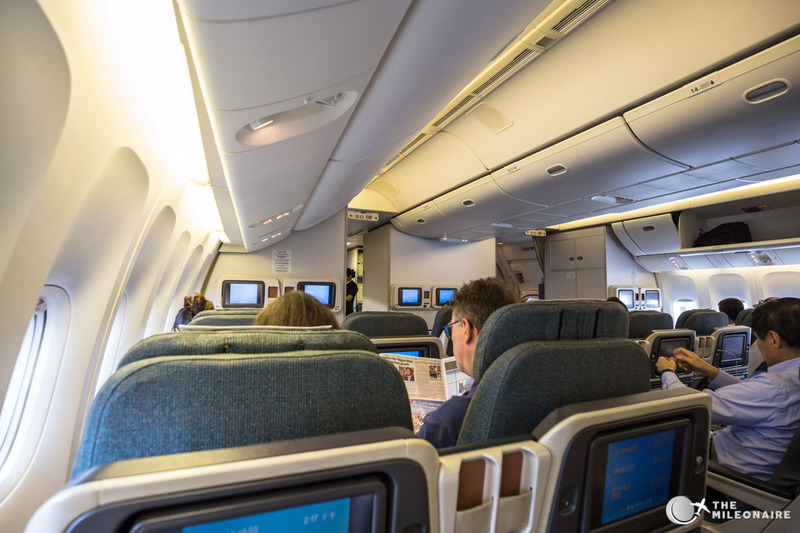 In general, Cathay’s 1-2-1 configuration is an excellent product. 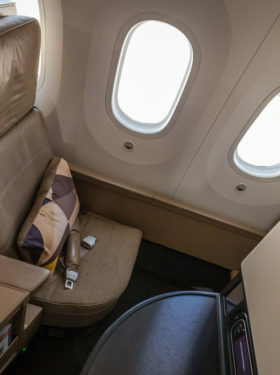 Despite the width of the Boeing 777 (which is wider than the A330, B787 or A350), Cathay did not give in and try to cramp more seats in their business class. Instead, the herringbone configuration with the typical Zodiac seats is also being used in the 777s. This configuration results in a lot of space, and a lot of privacy – as the angled seat configuration lets you face away from other passengers. 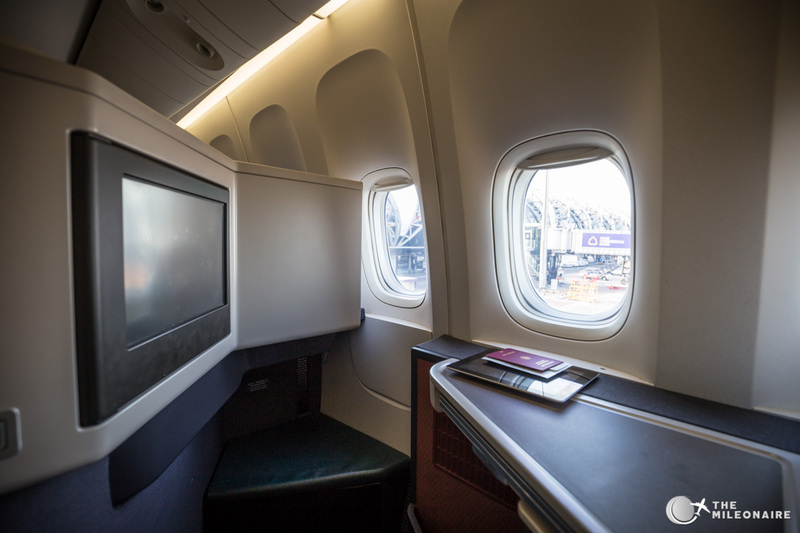 The business cabin in Cathay Pacific’s 777: lots of space in a 1-2-1 configuration. 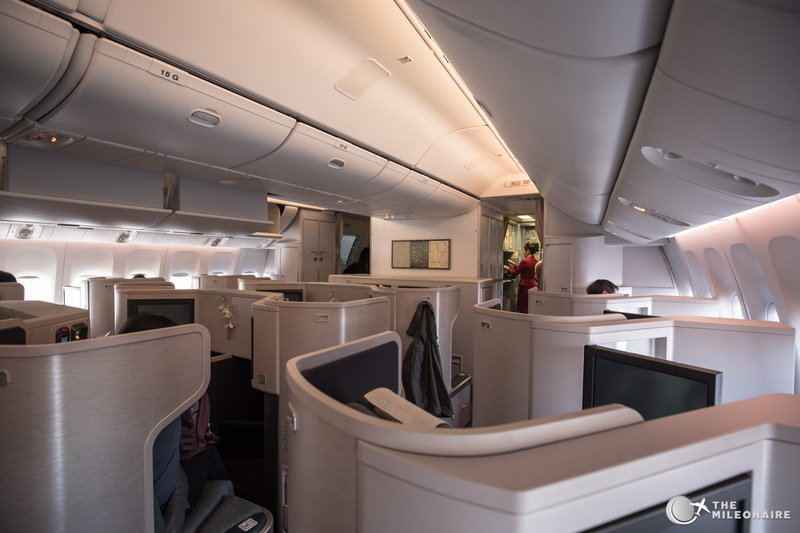 When you’re flying with Cathay Pacific around Asia, there’s also a chance to get a 777 with the old regional business class with a completely different 2-3-2 cabin. 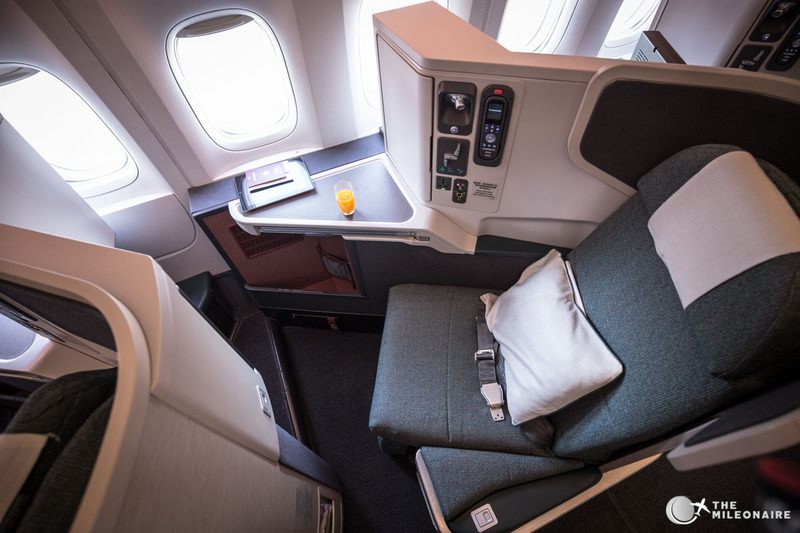 Even though other airlines use a similar configuration for every business class, it still feels like a downgrade to the “real” Cathay Pacific 777 Business Class. Beware: not all 777s have the new business class product, some of them still use the old 2-3-2 setup which is clearly a downgrade. After boarding you’re guided to your seat, in my case always one of the nice single seats at the window. Even though it’s a bit tough to look out the window, the privacy of the herringbone seats outscales all potential drawbacks. Lots of privacy thanks to the herringbone configuration, especially when choosing the single seats at the window. The Zodiac seat is fully lie-flat, so it can be converted into a real bed. Due to the angled configuration, the bed feels pretty wide – same as in the upright position. The leg space is quite large as well, including a small ottoman to relax. Lots of leg and storage space: the seat itself feels very spacious and intimate. 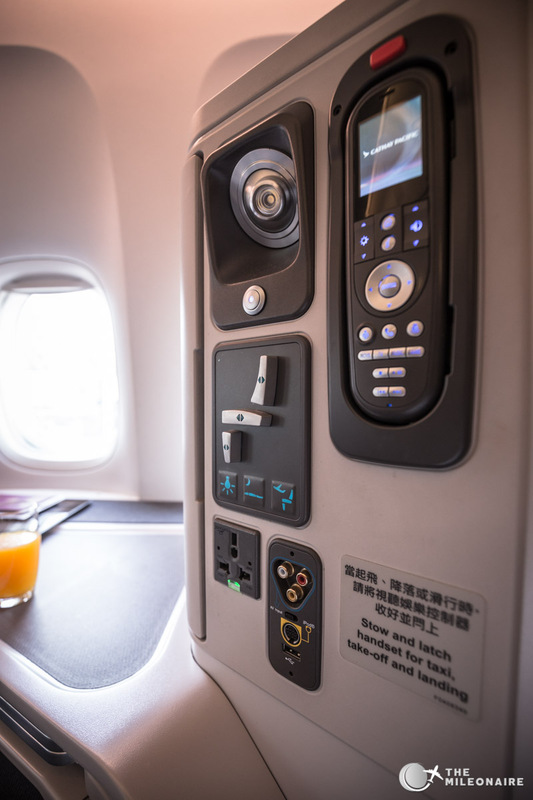 Towards the window is the control panel for your seat (where you can adjust three angles individually), as well as the handheld device that controls the in-flight entertainment system. In contrast to Cathay’s Business Class in the A350 there are also additional power outlets on the 777 to charge your laptop or smartphone. The control panel on the side lets you control virtually everything in your seat. After that we started our taxiway and headed off to Hong Kong. 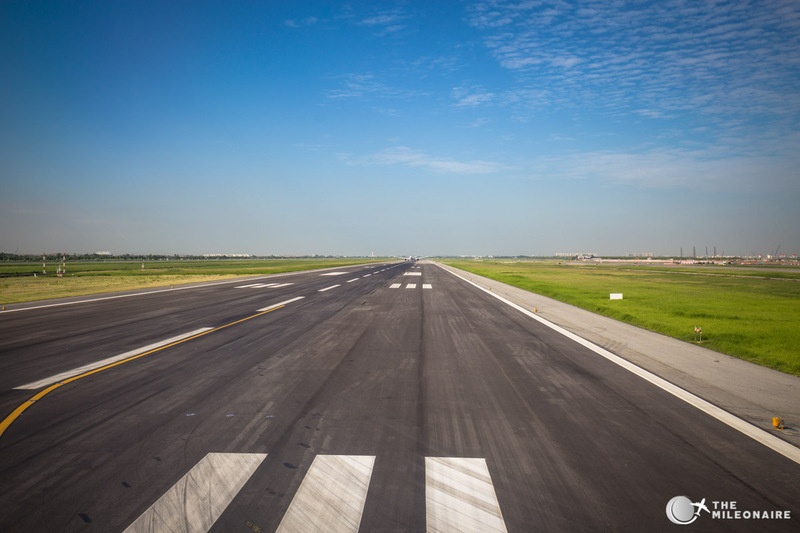 The runway at Bangkok Airport: off to Hong Kong! 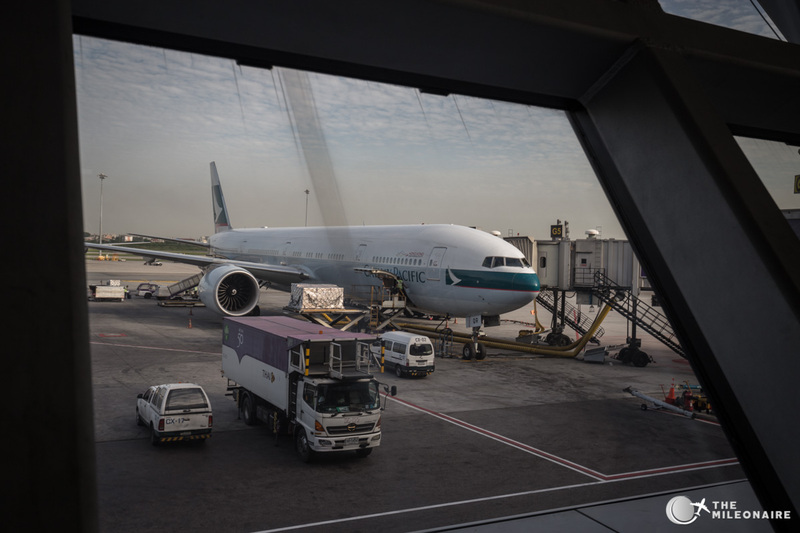 Frequent Cathay flyers might have realized it already: Cathay’s business class seat in the Boeing 777 is nearly exactly the same as in the new A350. Only some small differences exist, like some materials, the screen size or the power outlets mentioned before. The cabin looked a bit older as well, but that’s different from plane to plane. Two breakfast options were offered: Omelette or Stir Fried Noodles. 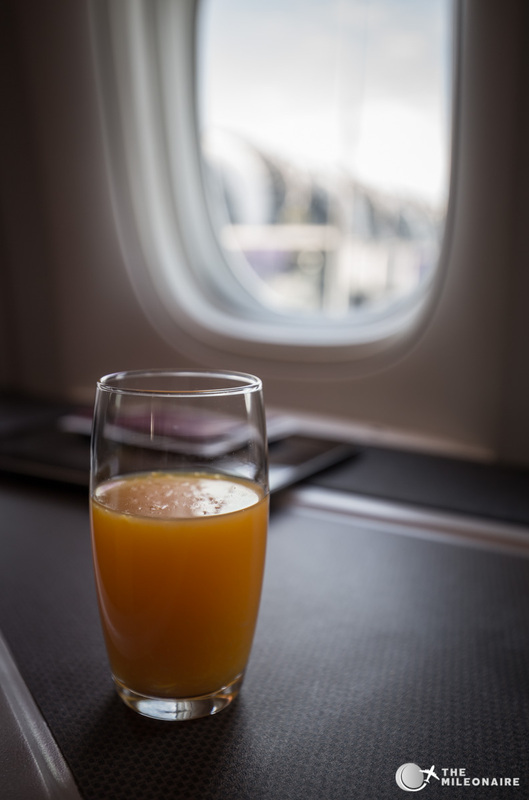 Bad luck if you always need champagne: there is none during morning flights! After a short breakfast, the typical Häagen Dasz ice was a great way to close out the efficient breakfast service, and we were preparing our descent into Hong Kong. 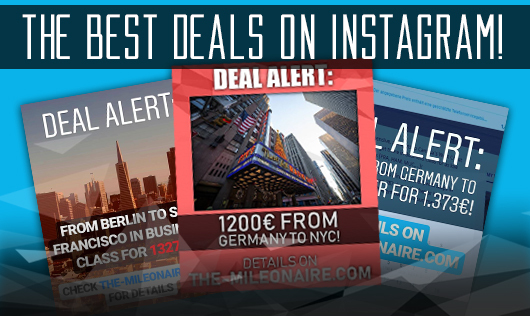 Even though the “regional” 2-3-2 Boeing 777 is definitely not state-of-the-art when it comes to international business classes, the 1-2-1 configuration with the excellent Zodiac seats reviewed here is outstanding. 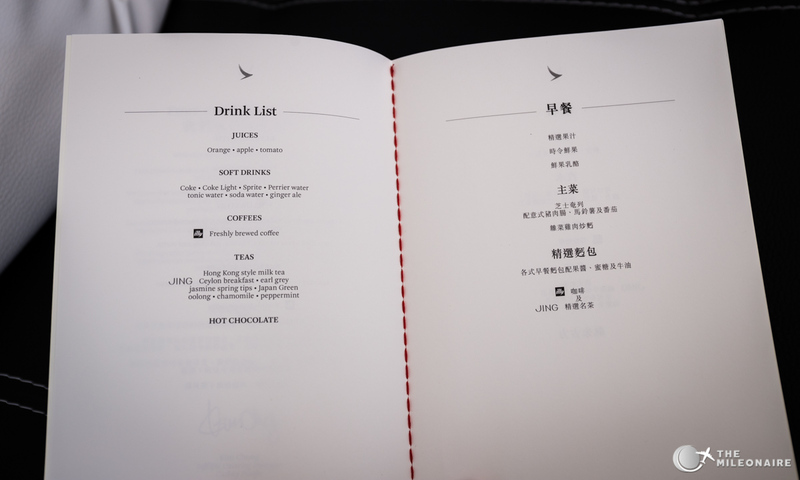 While European and American airlines downgrade their regional products in business class more and more, Cathay’s product makes flying short hops very enjoyable with an excellent hard and soft product. The A350 do have a power outlet and an USB port inside the side storage when the headset is.